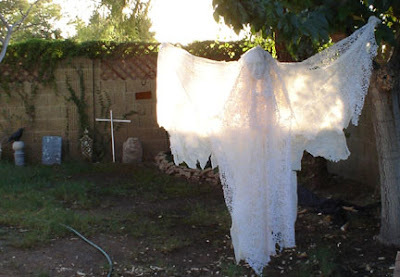 Ghost Hunting Theories: Halloween Party Props - Cheap and Easy! Halloween Party Props - Cheap and Easy! Some cheap acrylic paints, styrofoam balls, fishing line, fabrics, and 3" thick styrofoam blocks and you're ready to go for Halloween! In this case (below), I took a corner of the yard and made it into a cemetery by lining up some broken up cinderblocks I had for drainage in planting pots. This helped to define the area. I then took some garden statues I had and made some headstones out of styrofoam and painted them to look old and splotches of pale blue and bright green for lichens and moss. To finish it off, I added a ghost by using a styrofoam ball and a plain white craft mask (from Michaels store). 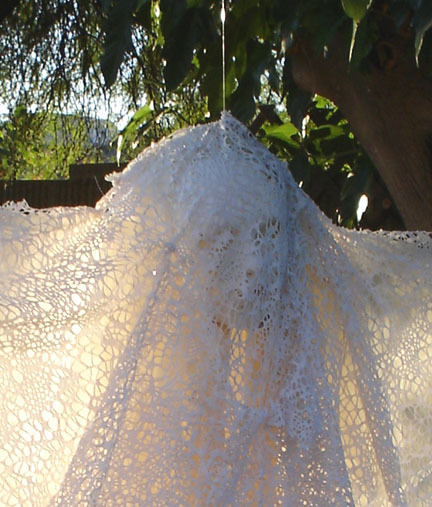 I put a hairpin in it to loop some fishing line, and draped a tattered sheet over it that I got at Goodwill. With an appropriate spotlight at night, this is awesome, even better if you add some fake crows and lighting flashing light. I made a "fence" with some styrofoam chain I had for Halloween and a couple of garden lattices I had. 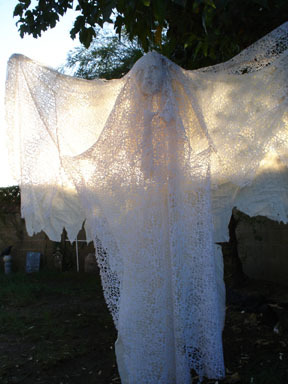 This ghost (below) I did from a tree so it would bob in the wind and greet folks as they entered the yard. This was a similar configuration with a styrofoam ball with a hairpin in it, fishing wire looped in, a white plain craft mask and a fabric that had holes in it. 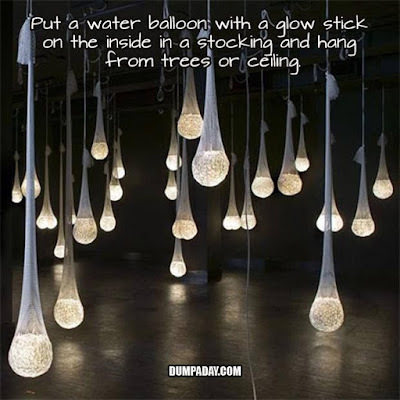 At nighttime it catches your eye in the dark, but you can also put a flashing light on it with thunder sounds or you can put a blacklight on it and let it glow. 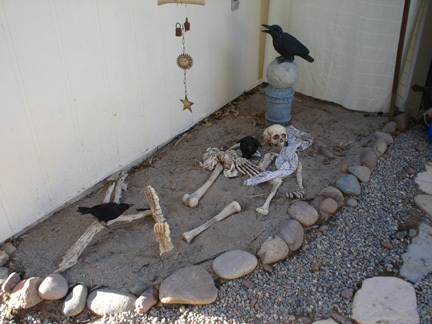 I already had skeleton parts for halloween and some crows, so I made a little scene of a body rising out of the grave. This helped fill in a spot in the yard not being used but needing some interest. 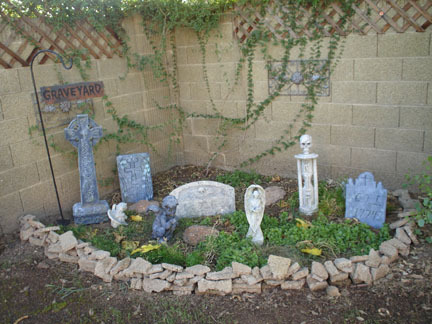 I used up the area around a wall with headstones. They aren't in the way for people to trip over, but they give yet another view of the postapocalyptic graveyard theme. 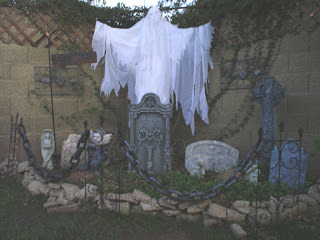 The crosses were made out of wood from 2 old lattices I took apart. 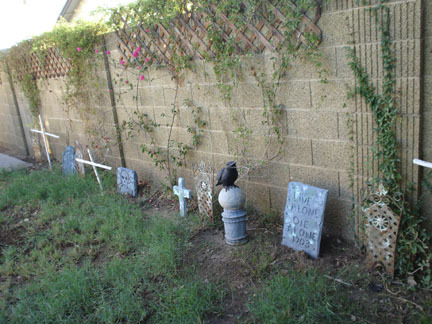 I made a ton more of these crosses for the entry part of the backyard and painted them with fluorescent paint and put a black light on it to glow. I used up all the wood. 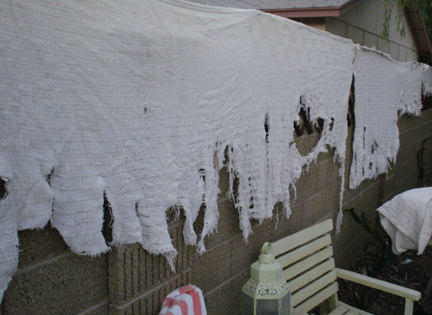 On the wall around the swimming pool, I hung tattered fabric to make it look destroyed. I then put up spider webbing around the pool with giant spiders made with black pipe cleaners and styrofoam balls painted black. 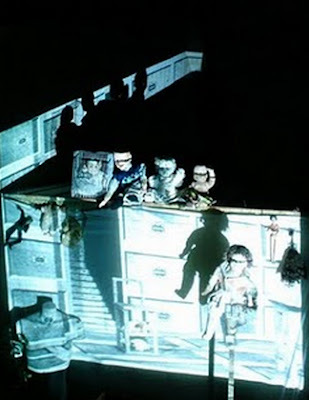 An added dimension to any part is projection. There are great projection DVDs at AtmosFX (my favorite) but you can also project a classic horror movie like "Nosferatu," "Night of the Living Dead," or "Halloween." 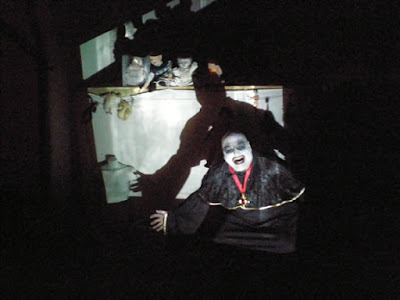 In this case, I projected a creepy stop animation film by Brothers Quay "Street of Crocodiles" that involved baby dolls. 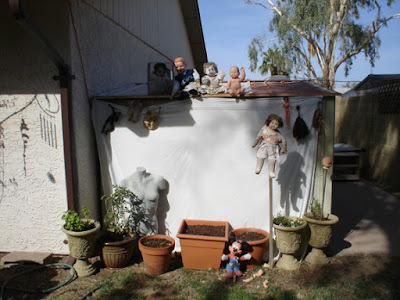 To add more to the projection, I put real dolls around the screen. 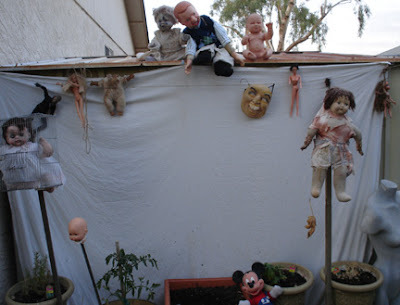 Don't neglect the idea of a dummy. This one was build on a post that helped support it and wore a gas mask we had from a vintage collection. 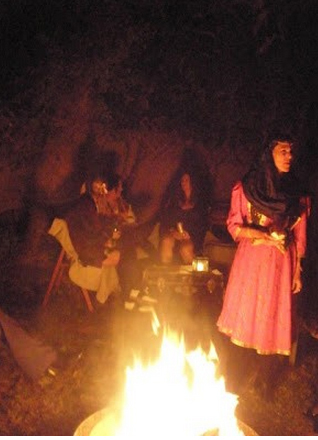 Nothing says Halloween gathering like a bonfire or a firepit. Don't neglect that atmosphere-raising item. In fact, consider doing a little scary story telling around the fire while you flash lights in the background with thunder sounds. 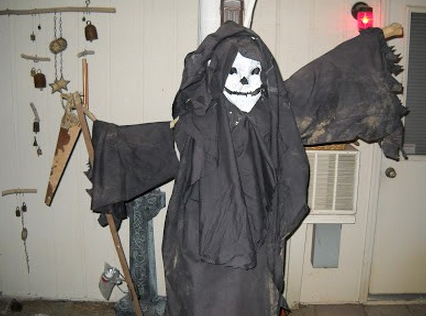 I made a paper mache mask for this dummy and tied it to the porch post, using limbs for arms and a Halloween hooded gown costume. I even had it holding a tree limb saw. Sometimes, your party guests are your best props! Balloons, pantyhose and glow sticks - so simple, but hanging from a tree, quite full of impact! 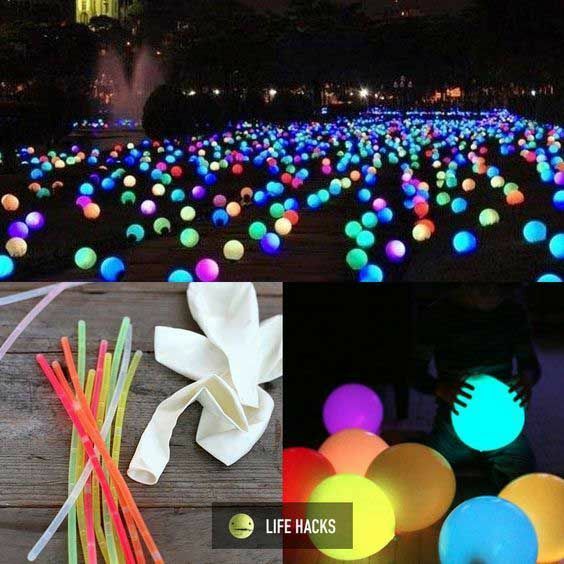 Or take the balloons and glow sticks and fill a yard or a pool. Setting up a selfie station with masks and hats, props and such can be a cheap and easy thing to do. Tack some fabric on the wall or put a mannequin nearby to pose with. 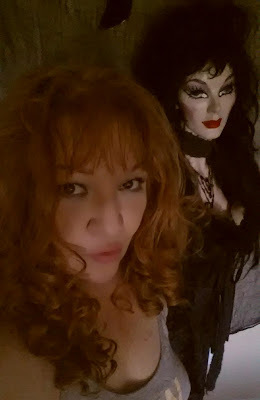 Every party should have a costume box and perhaps a picture frame suspended from the ceiling to get behind and take a selfie. It's standard these days.